The idea of “complete streets”—that is, streets designed with all users, not just cars, in mind—isn’t a new one, but it hasn’t caught on everywhere yet. On Friday, planners, engineers, advocates, and students convened at the second annual UCLA Complete Streets for California conference at the Kyoto Grand Hotel downtown to renew their excitement in complete streets, see photos of cool projects around the country, and discuss how to make complete streets the norm in California. Advocates hope a widespread focus on complete streets in California could help reduce greenhouse gas emissions by encouraging more walking and biking, but also promote healthier lifestyles, as explained by UCLA public health professor Richard Jackson. 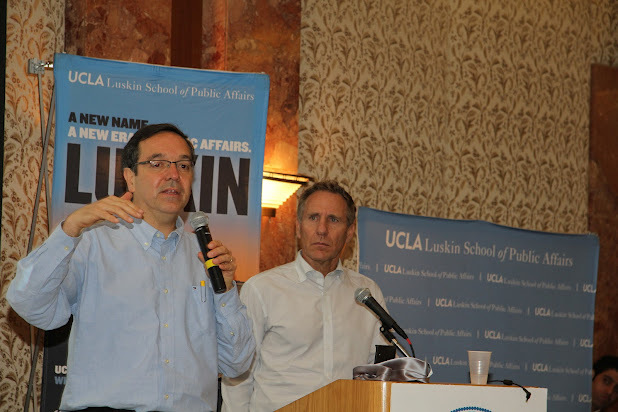 He reminded attendees that Californians aren’t unique in their attachment to automobiles, and that some of their attachment may be a myth—one-third of Los Angeles residents do not drive. He offered encouragement like, “If these cities [Copenhagen, Vancouver] can do it, any city in California can do it.” If there’s a will, there’s a way, given, of course, the right combination of funding and support from city staff, politicians, and citizens. In Los Angeles there’s a unique combination of challenges, not the least of which is a minimum of four different agencies own the streets, reminded Tim Papandreou, deputy director at the San Francisco Municipal Transportation Agency. A former Angeleno, Papandreou brings both a local perspective and that of a distanced observer to his view of how L.A. develops. Despite the constraints, some progress has been made in LA since last year’s conference. For one, a complete streets program was made official in October 2011with the Model Design Manual for Living Streets for Los Angeles County. On Sunday, the Sunset Triangle pedestrian plaza, the first of its kind in LA, opened in Silver Lake at Sunset Blvd. and Griffith Park Blvd. At the conference, Valerie Watson, board member on the Downtown Los Angeles Neighborhood Council, discussed plans for three “parklets” (mini parks) downtown that would each take the place of two on-street parking spaces. The project, which would create a communal space, an active space, and a passive space for people, was approved by council motion in September, and may be erected as early as this spring. Complete streets may slowly be coming to Los Angeles—and California. But a wrap-up session on moving forward and making more changes sparked a lot of talk and not many answers. Governor Jerry Brown’s dissolution of redevelopment agencies , which provided funding for many of these projects, may complicate matters. The complete streets initiative, though, is still getting started. There is ample material for research still to be done and learning from the successes and failures around the world. Brian Taylor, professor of Urban Planning at UCLA and director of the UCLA Lewis Center, noted that the idea has generated a lot of excitement (particularly at the conference Friday), and that we may well be a transition period from an era of street design focused on cars to an era of street design focused on people, not cars. Great overview of the key messages. I particularly agree with one of your final points about research. There is still a critical lack of empirical evidence to back up our Complete Streets pitches to elected officials, business interests, and members of the public. UCLA has stepped up with funding and institutional support, as have several non-profit orgs in the region. But we can still do a lot more to encourage students, faculty, public agencies, and others to conduct original research and case studies that will help advocates of complete streets to make a stronger argument for funding and policy changes. We can start by asking current philanthropic organizations to include some of these initiatives in their range of potential grant recipients. At the "Focus on the Future" conference in San Francisco, put on by the "Self-Help Coalition," a warning was sounded: the Bay Area, and other regions, better deal with housing costs and livability issues before it's too late.